The FOBPL Board organizes special events from time to time. These events are designed to raise the profile of the Friends and the Library. The Friends have organizaed author talks, poetry readings, and musical performances by leading artists. These programs are in addition to the many wonderful adult, teen, and children’s programs organized by library staff and funded by the Friends. The Friends take a special interest in hosting events for Bronxville Village residents who are authors, poets, musicians, and artists. If you are a Bronxville Village resident, please contact the FOBPL, at fobpl10708@gmail.com, to discuss the possibility of a sponsored event. SEE THE LIBRARY CALENDAR OF EVENTS FOR INFORMATION ON UPCOMING PROGRAMS SPONSORED BY FOBPL. Raise Your Glass to Hemingway!! The Friends of the Bronxville Public Library (FOBPL) are encouraging book clubs to read Min Jin Lee’s Pachinko, a finalist for the National Book Award, a national bestseller and a New York Times Editor’s Choice, in preparation for a special conversation with the author. Min Jin Lee will be interviewed by Bronxville’s Sissel McCarthy, Distinguished Lecturer and Director of the Journalism Program, Hunter College, and the audience will participate in a book discussion. - Copies of Pachinko are available at Wormath's Book Shop. - There is no charge but seating is limited. There was no mistaking the size of the crowd that gathered in Concordia College’s Sommer Center on Jan. 23 to hear Min Jin Lee, author of the bestselling novel “Pachinko,” a finalist for the National Book Award and one of the New York Times’ Top 10 Books of 2017. Nearly 350 community members attended the conversation with the author, conducted by Sissel McCarthy, Distinguished Lecturer and Director of the Journalism Program, Hunter College. Violist Kathryn Lockwood returns to the Bronxville Library on with pianist Jon Klibonoff in a varied program for viola and piano. A native of Australia, Kathryn Lockwood has been hailed as a violist of exceptional talents in reviews around the country and abroad for her performances as a chamber musician and soloist. Prize winner and faculty member of Manhattan School of music. Jon Klibonoff hails from NY and has appeared as orchestra soloist, solo recitalist, and chamber musician throughout the U.S. and abroad. Together this dynamic duo will play sonatas by Brahms and Poulenc; Fantasiestucke by Schumann, and a zen & programmatic piece by Japanese composer, Somei Satoh. These two world renowned musicians who happen to live locally, are not to be missed in this intimate setting at your local library. Can you find the hidden references and paraphernalia that could indicate a teen’s drug or alcohol use? A replica of a teen’s bedroom will test your knowledge and strengthen your observational skills. TUESDAY, JANUARY 9, 2018, 7:00 P.M. The Maxwell Institute, 92 Yonkers Avenue in Tuckahoe, offers outpatient addiction treatment for adults and adolescents and community education programs. Matt Van Brink is a composer, educator, lyricist and pianist living in New York. He heads the songwriting and composition department at Concordia Conservatory in Bronxville. His concert works, arrangements, and musical theater works, written for a wide variety of ensembles and performing forces, have been performed around the world. Along with close personal acquaintances, he will perform an afternoon of his original songs for the young and young-at-heart. Admission is free of charge. Concert best suited to school age children up to 12 years of age. Enjoy an afternoon of Classics from The Great American Songbook with Singer and Bassist Chris Conte. Chris will be joined by Jay Azzolina (guitar), Darren Litzie (piano), and Andrew Swift (drums). The Chris Conte Quartet presents time honored favorites in a way that satisfies audiences of all types with classic love songs, hard swinging jazz, tender ballads and beautiful bossa nova. Chris' debut album, "Our Love Will Last" will be available for purchase. Admission is free of charge. Trio Shalva is a bold and genre-bending group formed by three jazz musicians, all born and raised in Israel, who first started playing together in New York City four years ago. Their collaboration creates a powerful new realm of music where Hebrew folk traditions and contemporary jazz are woven together seamlessly to create a fabric of sound that will transport any listener through time and space to a new Middle Eastern musical landscape. Assaf Gleizner (piano/melodica), Koby Hayon (bass/acoustic guitar/oud), and Nadav Snir-Zelniker (drums/percussion), each a sensitive player in his own right, create an innovative richness of sound that both honors the musicians’ homelands and pushes the boundaries of modern jazz. "Shalva" is the Hebrew word for "serenity". Mr. Gleizner, Mr. Hayon, and Mr. Snir-Zelniker paint broad, colorful strokes that shift effortlessly from ethereal, melancholy melodies to grand, exotic themes. The group’s astonishing diversity garnered rave reviews and loyal fans with their first 2 albums, Riding Alone (2011) and Breeza (2014). The group performs regularly in New York City at venues such as Birdland, Kitano and others and around the Tri-State area. It opened for acclaimed Jazz artists such as Pat Metheney and Paquito d’Rivera, and has been invited to Klezmer festivals in Brazil. As recipients of the American Israeli Cultural Foundation Scholarship, the three members have been performing in various AICF events at Lincoln Center. In addition, the group has been giving concerts for the non-profit organization "Concert In Motions" as well as offering educational workshops to schools and community centers. Hailed by the Los Angeles Times as “representing the young, up-and-coming generation,” and a “superb cellist with with a large, expressive, singing tone, passionate musicianship, and magnificent playing" by Journal Tribune, Grand Prize Winner of the International Chamber Music Competition of New England, Armenian-American cellist Ani Kalayjian enjoys an exciting career that has taken her to Japan, Australia, Canada, Europe, and the United Sates, both as a soloist and chamber musician. Most recently, Ani performed Haydn, Beethoven, & Schubert for the Princes of Qatar & Princess Eugenie of England at the Frick Museum as well as Brahms chamber music for the co-founder of Facebook. This season will include tours around the United States as a chamber music artist on the Saugerties ProMusica series in NY, American String Project in Seattle, Brooklyn Historical Society in NY, Fortuna Concert Series in CA, Ridotto Series, Concerts International Memphis, among others and a commissioned world premiere by Polina Nazakinskaya as well as her debut at the Chateau de la Moutte festival in St. Tropez. Ani Kalayjian will be joined by Emily Daggett Smith. A violinist praised as playing “gorgeously” and with “gracefulness and easy rapport” (The Boston Globe) Emily is emerging as one of the most compelling artists of her generation. Her recital and chamber music performances have taken her across the United States, Europe, South America and Asia, and she has been described as playing with a “very beautiful tone” (The Gathering Note) and “irrepressible élan” (The Seattle Times). An avid chamber musician, Ms. Smith performs regularly at numerous festivals and series around the country such as the Concordia Chamber Ensemble, Festival Mozaic, Lenape Chamber Ensemble, Mainly Mozart Festival, Ravinia's Steans Institute, and the Seattle Chamber Music Society. Her performances have taken place at some of the world’s greatest halls including Carnegie Hall, Alice Tully Hall, the Shanghai Grand Theatre and the Vienna Konzerthaus, and have been featured on PBS's national broadcast Live from Lincoln Center, NPR's From the Top, Classical King FM in Seattle and WWFM The Classical Network in New York and Pennsylvania. As the only co-ed a cappella troupe in Scarsdale High School, For Good Measure fills the community with music! Now in its 16th year the troupe performs at sports games, a cappella competitions, shows, Valentine's Day Sing-a-Grams, and during the holidays. In addition, For Good Measure has performed in concerts with groups from Yale University, Dartmouth College, Binghamton University, and Kenyon College. For Good Measure’s repertoire includes a variety of song types, often including oldies as well as contemporary pop songs. The group is not only talented, but always makes their performances fun to watch for all types of audiences. The concert is free and open to the public. No reservation required. The concert is free and will be followed by a reception. PRIMARY and CRISIS are rarely shown, newly remastered classics… breakthroughs in what became known as cinema vérité. PRIMARY was the first time a hand held camera followed characters (John F. and Jackie Kennedy) through real events (a primary against Hubert Humphrey). The films will be introduced by the filmmakers’ children, Allison Devlin (Shuker) and Thatcher Drew. Both live in Bronxville. Allison grew up in the village and now works at Time Inc where, ironically, her father and mother both worked. Thatcher worked with his father. His first job was at JFK’s funeral. Bronxville resident Larry Newcomb was not content with a PhD in music history, moving on to study under Bucky Pizzarelli, Pat Martino, Howard Roberts and others. There’s plenty of technique here – he is, after all, a respected teacher as well as a performer. The Quartet's intention is to provide enjoyment and beauty! This aim is achieved through keeping the melody up front and underpinning it with sensitive but powerful touches from drummer Jimmy Madison and Bronxville's own bassist Dmitri Kolesnik. On Hoagy Carmichael’s ballad Stardust, Eric Olsen's exceptional piano work and Larry's guitar converse easily like old friends. It’s six minutes of sheer relaxation! The Quartet also grooves hard tackling smart originals as well as well-loved jazz standards by pioneers as diverse as Charlie Parker and Carla Bley. Experience the Larry Newcomb Quartet in your local surroundings - the Yeager Room at the Bronxville Public Library. The concert is FREE and refreshments will follow with a chance to meet the musicians. Racing along with our new global society, duoJalal builds bridges from their home in New York connecting the planet to create some of the world’s most exotic chamber music. Prepare to be enthralled as Lockwood, a classical violist from Australia embodies a gypsy violinist one moment, a Middle Eastern reed flutist the next. Sheronick, of Lebanese descent, dazzles as his fingers snap at the edge of an Egyptian frame drum and his foot drags across the Peruvian cajon. duoJalal will perform works by composers Giovanni Sollima, Zhao Jiping, Shirish Korde and more. Dr Sándor Szabó will performed works by renowned composers from the Renaissance, Baroque, Classical and Modern eras and offer insights into compositions, national styles, periods and forms. The program will encompass works by composers native to England, France, Hungary, Italy, the Netherlands, Spain and the United States, including Bach, Byrd, Frescobaldi, Sweelinck, Couperin, Rameau, Mozart, Beethoven, Martinu, Farkas, Dowland and Bartok. Dr Szabó is the Minister of Music/Organist at The Reformed Church of Bronxville and has performed extensively on the harpsichord, piano and organ throughout major concert halls and churches in Europe and North America. A Romantic Tale" featured cello-piano duo Ani Kalayjian and Ilya Kazanstev. 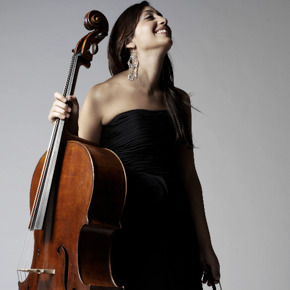 Hailed by the Los Angeles Times as “representing the young, up-and-coming generation,” cellist Kalayjian has appeared in concert both as a soloist and chamber musician in the United States, Canada and Europe. Kazantsev is a fresh and exciting presence on the international music scene, having performed as a recitalist and soloist with orchestras extensively, including concerts in Russia, the United States, Canada and Europe. Kazanstev began his music studies at the Central Music School at the Moscow Tchaikovsky Conservatory and in 2007, gave his sold-out debut at the Weill Recital Hall at Carnegie Hall as a winner of the Nadia Reisenberg Piano Award at Mannes College. The duo’s performance will feature a romantic program including pieces by Brahms, Arutunian and Part. Bronxville native, Holly Rudd performed works for the solo flute including Partita in A minor by J.S. Bach and “Danse de la Chevre” by Honneger. As a Master’s student at the New England Conservatory, Holly studies with the Boston Symphony Orchestra’s principal flutist, Elizabeth Rowe and has performed under notable conductors Keith Lockhart, Ken Lam, Christopher Konig and Matthias Bamert. FOBPL sponsors poetry readings from residents and poets. Most recently twelve people read from the works of Wilfred Owen and others. TK (name to come) a Gold Star Wife read her own poetry in remembrance of her fallen husband. Founded in 1941, The Princeton Nassoons are the oldest a cappella ensemble at Princeton University and the third oldest collegiate group in the nation. They are widely regarded as one of the finest a cappella performance ensembles in the United States. Tours have taken the group to Germany, Austria, Switzerland, France, Monaco, and the White House. The ensemble currently comprises 14 Princeton University undergraduates, including Bronxville native Chris Palermo.